Ro-Ro vessels, car carriers or vessels with other neo-bulk cargoes may also be accepted, depending on circumstances. 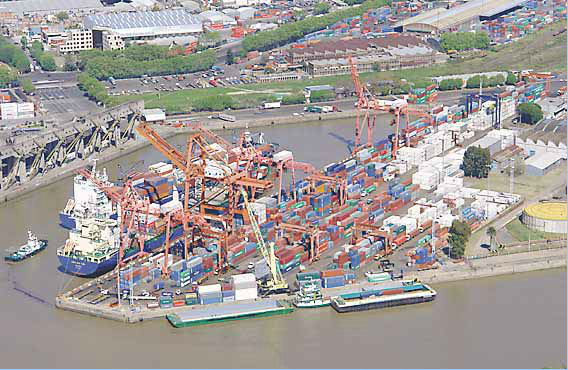 Extent: Basin D westside, northside, Pierhead No 5, together with adjacent areas west of berth including Wilson and Ericsson container storage area. Total 25 hectares. Weighbridges: 1 at CFS; additional weighbridge at entry Gate. Railway Sidings. Located on westside of terminal and available for transshipment operations. Serving BAP Ferrosud NCA Lines. Cranes: 1×50 ton super post-panamax quayside gantry crane, outreach 46 m.
1×45 ton post-panamax quayside gantry crane. 3×45 ton Quayside Gantry container cranes, outreach 40 meters. In good condition.Additional container storage areas adjacent to ex Plazoleta Wilson. LCL´s at CFS on terminal premises. CFS. Bonded warehouse on west side of terminal having 7700 sqm fitted with numerous storage racks and equipped with closed circuit televisión surveillance. 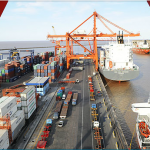 The terminal is self sufficient and all FCLs/LCLs whether import or Export can be handled on the premises. Adjacent to CFS additional warehousing of 4500 sqm covered area is available for storage of goods that have been cleared through customs. CY/CSA. 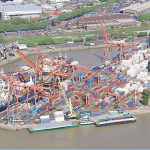 180.000 sqm for approximately 3000 TGS (capacity 400.000 TEUS annually). Facilities for the storage of empty containers have also been arranged alongside Basin F.
C.D. All facilities available on premises. Liebherr Mobile cranes 1×104 ton. 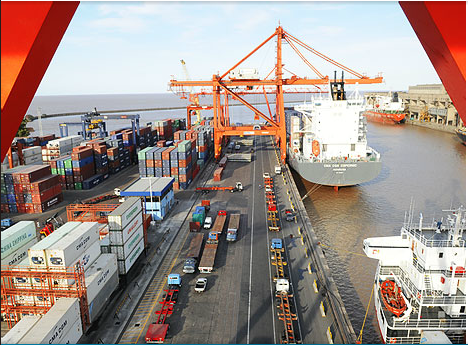 Terminal is fully computerized including Navis SPARCS system to support Ship-terminal planning, plus radio data link (LXE) connecting operations office directly with yard personnel. Direct Maria customs link. Intranet on-line booking Service and client Access to data base for container tracking. Electronic payment system available.